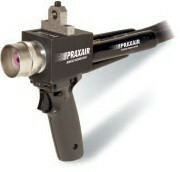 The Model BP-400 Arc Spray is a push wire system that is lightweight and portable. This system can be used in hand-held or robotic applications in industries including but not limited to automotive, general machine and maintenance. The BP-400 is simple to operate. For hand-held operations the BP-400 offers a one touch, point and shoot trigger. For manipulator mounting, the handle is removed and a single electrical closure provides complete system on / off control.